Release Date: Appeared as the artwork for the 1947 FOUR SEASONS calendar ( NOTE: This is NOT from the calendar, this is the ARTWORK that was. Print size (approx.). (This is a single piece, but the 4-item set is also available). ). Glossy finish. Highly sought after and sure to go up in value. As issued in Derriere Le Miroir #225, has text or image on verso. IN FANTASTIC CONDITION. The photos don't do it justice because of the flash. Twilight Martinique. 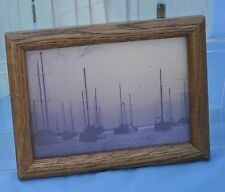 This print is of a picture of sailboats in Martinique at sunset. Sixth Print. Early work for Artist/ Photographer. Highly sought after and sure to go up in value. As issued in Derriere Le Miroir #225, has text or image on verso. IN FANTASTIC CONDITION. The photos don't do it justice because of the flash. 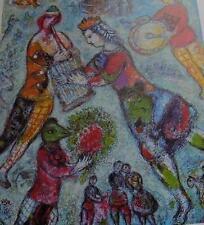 Art criticRobert Hughes referred to Chagall as "the quintessential Jewish artist of the twentieth century.". FRAWGGE MFRG. Title: FRAWGGE MFRG. His characteristic pen-and-ink drawings often depict vaguely unsettling narrative scenes in Victorian and Edwardian settings. Artist: Edward Gorey. Paper: Heavy semi gloss paper. Gashlycrumb Tinies. Title: GASHLYCRUMB TINIES. His characteristic pen-and-ink drawings often depict vaguely unsettling narrative scenes in Victorian and Edwardian settings. Artist: Edward Gorey. Paper: Heavy semi gloss paper. 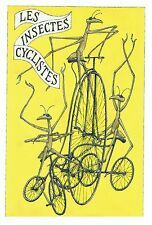 Lot of 2 EDWARD GOREY "LES INSECTES CYCLISTES" LARGE 10"x 15"
Illustrations from Les Insectes Cyclistes. Title: LES INSECTES CYCLISTES. His characteristic pen-and-ink drawings often depict vaguely unsettling narrative scenes in Victorian and Edwardian settings. His characteristic pen-and-ink drawings often depict vaguely unsettling narrative scenes in Victorian and Edwardian settings. Artist: Edward Gorey. Title: TWELVE LORDS a'LEAPING. This is a lot of two separate prints! This is a classic example of the surreal world of Edward Gorey. His characteristic pen-and-ink drawings often depict vaguely unsettling narrative scenes in Victorian and Edwardian settings. Illustration from CREATIVITY. Illustration from EDWARD GOREY. His characteristic pen-and-ink drawings often depict vaguely unsettling narrative scenes in Victorian and Edwardian settings. Artist: Edward Gorey. Title: SELF PORTRAIT. Most everyone has at least one favorite of his illustrations. Perfect for matting or framing. Great for yourself or as a gift. 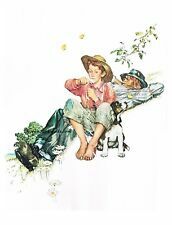 Artist: Norman Rockwell. This is for a lot of. Illustration from "A FOR AMY, B FOR BASIL". His characteristic pen-and-ink drawings often depict vaguely unsettling narrative scenes in Victorian and Edwardian settings. Artist: Edward Gorey. Title: A FOR AMY, B FOR BASIL. Artist-Roy Lichtenstein. Title-Fourth Annual New York Film Festival. 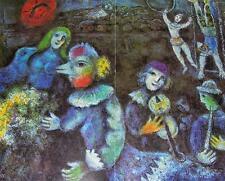 Title-Eighth New York Film Festival T.
Dreams of the Garden of Desire by Arlene Noel. Flight of the West Wind by Jim Paul. The Flower of Forgotten Love by Rainer Koenig. The Land of Nod by Tracy McVay. Mistress of Sea and Light by Dennis Anderson. Printed by Editions Braun on semi-matt 250 g art paper, using the very latest reprographic technologies. Photograph of Chinese Mountain Top Temple cancelled Stamp 11"x14"
Cancelled Chinese Stamp of "Woyun Temple". This professionally photographed 11"x14" cancelled on December 13, 1984. Limited edition of 50. Photograph of Shining Cloud Sea cancelled Stamp 11"x14"
Cancelled Chinese Stamp of Shining Cloud Sea. This professionally photographed 11"x14""official title is "Shining Cloud Sea at Jinding". Limited edition of 50.